The NATO AK comes with the full suite of Rifle Dynamics upgrades. In a partnership with K-Var, they start with some of the best and make them better. 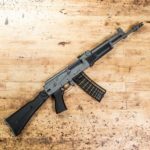 CZ USA is working on stocking shelves across America with brand-new BREN 2 complete rifles in 5.56x45mm NATO and 7.62x39mm. The AR500 is, according to the company’s claims and my own research, the most powerful short-range semi-auto rifle in the world. Chambered in the .50-caliber 500 Auto Max cartridge, the AR500 packs a wallop in a modified AR-10 platform. Combined with Buffalo Bore’s 350, 400, and 440 grain loads, the AR500 is ready to bring down, quite literally, any kind of critter you’re hoping to hunt. Precision rifle shooting is a very expensive hobby. One innovative way to get in the necessary trigger time is the .22 rimfire trainer. Molot AK47 7.62x54r, Russian VEPR rifle, New in Box!